A fact more commonly noted in texts heavy with archival sources are the difficulties faced by interpreters of documents dealing with dates. Depending on the location, year, day and even the time a clarification may be necessary to describe any differences with our modern perception of the calendar. In presenting this summary for discussion, I warmly invite any clarifications to the points mentioned in this post. It seems for some time in Europe and extending across into the Americas, much confusion was caused by the multiplicity and nuances of calendars being used - a disorientation I feel I've had a small taste of in researching this post. 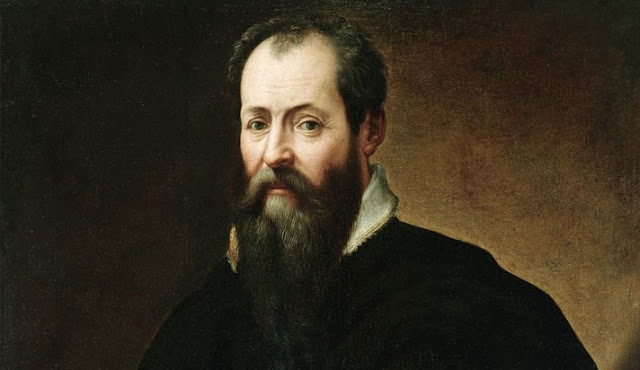 As a case study into the necessary clarifications that may be required, I would like to present a date related to a text that is central to the study of Renaissance art history - Giorgio Vasari's Lives of the The Artists. Most readers familiar with the era will recall the first edition was published in 1550. A second, revised edition was then issued in what is commonly cited as 1568. A full, digitised version is available at the internet archive, courtesy of the Getty Research Institute: link The specific line dating the dedication can be seen in the image below, which notes 9 January 1568. To describe this as "a publication dated 9 January 1568" is semantically correct, but does require some clarification. Calendrical calculations are a specialist area of knowledge, most clearly understood by archivists, historians of religious institutions, and historians of science, as these dates were commonly derived from astronomical observations. To better understand Vasari's dedication date, there are two computational steps which we must take into consideration, which I hope to describe below. In Vasari's time March 25 was known as the date of the Incarnation, or Annunciation, and was viewed as the first day of the year. To this day, it is still celebrated as a major liturgical feast day. This dating convention came to be known as the Calculus Florentius and is reported to have come to Florence in the Tenth Century (Cappelli), possibly originating in Fleury in France. In the context of the Christian calendar, March 25 was calculated as the date of the Annunciation in the Computus by Dionysius Exiguus in 525CE, who is best known for introducing the Anno Domini dating convention. In Florence, another key source for ratifying these Holy Dates is cited as the Constitutiones Episcoporum Florentini, dated 1310, which is described as an effort to align (or Romanize) the calendar of important Florentine church dates with that of Rome (Tacconi). The tradition of March 25 as the first day of the year persisted until 1750, when an official decree was issued by Grand Duke Francesco Stefano - also known as Holy Roman Emperor Francis I - aligning Florence with the Gregorian calendar in civic matters as well. 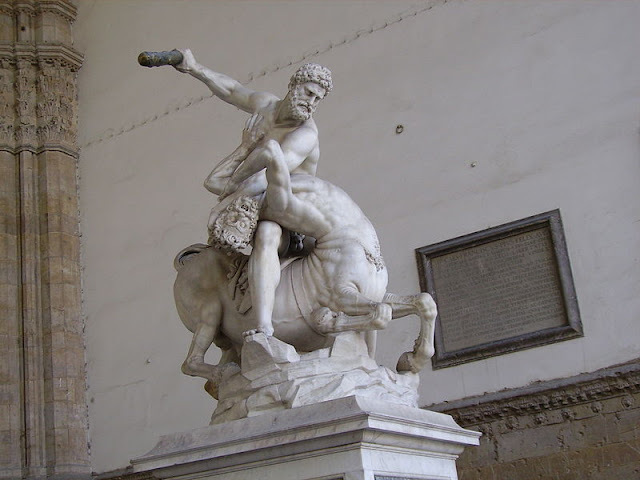 To this day, a commemorative plaque can be seen in the Loggia dei Lanzi, better known as being the site of Cellini's famous bronze Perseus and other well known pieces by sculptor Giambologna. The following suggested translation has been generously provided by Terrence Lockyer. See references for more information, including notes and expanded Latin text. 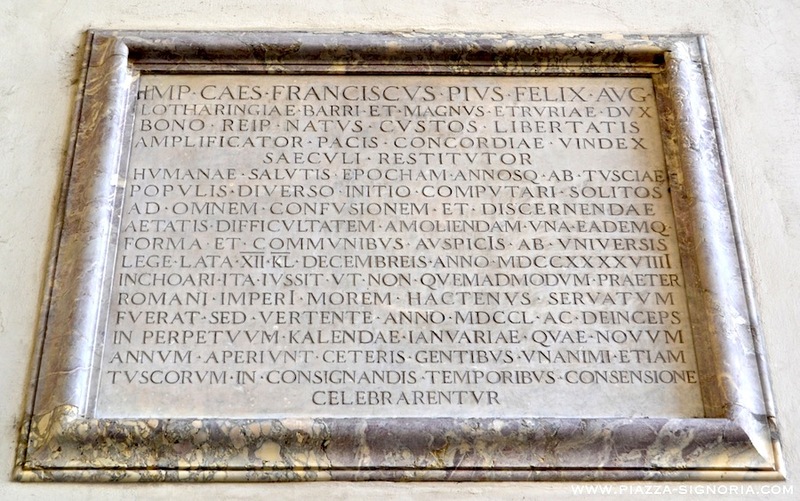 The Emperor and Caesar Francis, the Pious, the Fortunate, the August, Duke of Lorraine and Bar, and Grand Duke of Tuscany, born for the public good, guardian of liberty, increaser of peace, defender of unity, restorer of the age, for the purpose of removing all confusion and difficulty in determining time, ordered that the era of human salvation and the years, which used to be calculated by the peoples of Tuscany from a different beginning, should be commenced by all in one and the same form, and on a common basis, by a law of the twelfth day before the Kalends of December [November 20th] in the year 1749, such that the prior custom contrary to that of the Roman Empire should not be observed, but as the year turns to 1750, thereafter and henceforth the Kalends [1st] of January, which open the new year among other peoples, should be celebrated by unanimous agreement also of the Tuscans for the recording of time. 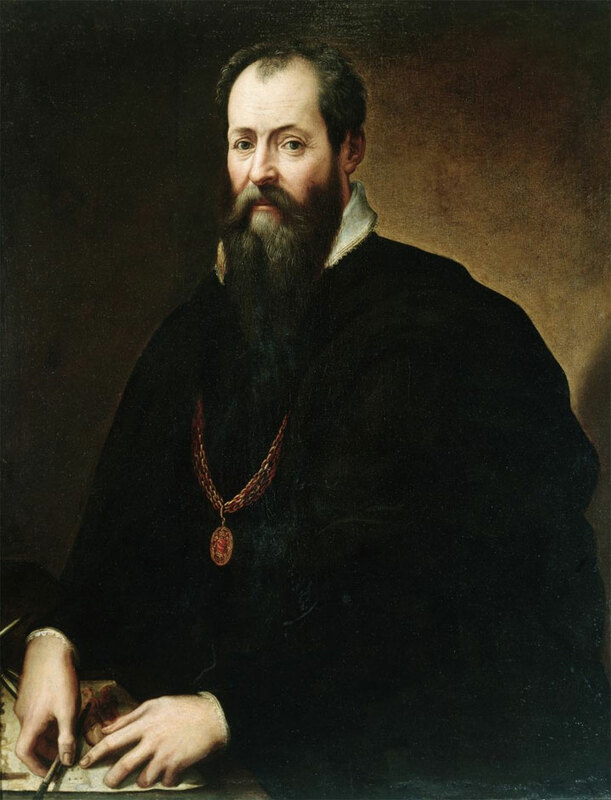 Hence, Vasari's dedication being on the 9th of January in 1568 according to his perception of the date, must be interpreted as 1569 according to the modern Gregorian calendar. For the purposes of clarity, this can be written as 1568/9 (Florentine year/modern year). To further clarify this however, we must consider the Julian calendar, which was in use during Vasari's time. The new calendar, drawn up by Aloysius Lilius and revised by Christopher Clavius, was promulgated in the bull Inter gravissimas of 24 February 1582, which ordained that 4 October in that year should be followed by the 15th, and that centennial years should be common unless divisible by 400. Thus 1600 (re-assuringly) remained a leap year, and likewise 2000, but 1700, 1800, and 1900 became common. The purpose of this reform was to restore the vernal equinox, not to its theoretical date in Caesar's calendar, which was 25 March, but to 21 March, the date pre-supposed by the existing rules for calculating Easter, then believed to have been laid down by the Council of Nicaea in AD 325. Although the church may have made an earlier adjustment to implement the Gregorian changes for key religious festivals such as Easter, documents related to civic matters continued to use the Julian calendar. Hence, writing in 1568/9 Vasari's perception of the date would have been according to the Julian calendar, dates of which can be calculated by the use of tables, or convenient online calendrical converters. link Subsequently, January 9 1569 in the Julian calendar is actually January 19 1569 in our modern Gregorian calendar. This may seem less relevant in terms of describing the publication of a book, but is an interesting consideration when trying to select a modern date to commemorate a pre 1582 event. A nice example of this came up when I was researching the interaction between Raphael and Dürer, which will be the topic of a upcoming post. 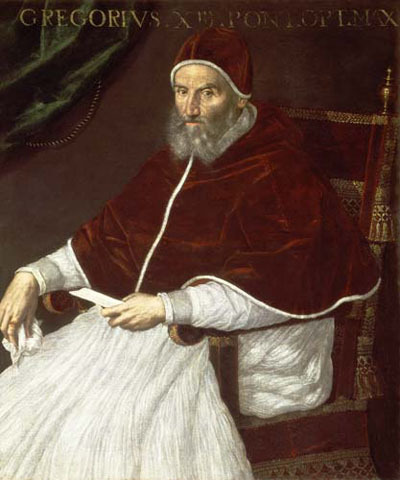 Noting both had died on April 6 1520 and 1528 (respectively), this means that to commemorate these dates in the modern era, we would need to make the adjustment to the Gregorian equivalent of April 16. Further complications - the Michelangelo extract? The date of this letter, 6 February 1567, that is in 1568, following the modern calendar, permits correcting a probable error in the complete edition of the Vite (1568)...In fact, the dedicatory letter of all of the Vite, addressed to Duke Cosimo de’ Medici, carries the date of 9 January 1568 (modern calendar: 1569). Unless one attempts to maintain that this letter was printed when the rest of the work was already published, the date of the letter needs to be corrected to 9 January 1567 (modern calendar: 1568). This is because the off-print of the Michelangelo vita would otherwise be prior to the full edition of the Vite. Whilst the potential 1567/8 publication date of the complete Vite is an interesting topic for debate there seems at present too many variables between the dedicatory letters and the published dedication to Cosimo to conclusively state that the 1568/9 date is in error. To best verify this would require viewing the manuscript versions of the originals, which from references cited, could not be discerned to exist. In addition, some further correlating evidence would be required to verify the time the Michelangelo extract was printed, and if any adjustments were made to the dates upon printing. Therefore, when describing the publication date for any work of the period, the year listed on the frontispiece, as opposed to the date of the dedication letter is usually followed. To better describe which editions were published at what time would require other sources of evidence to verify when the works were printed and/or made available for sale. nb. in some texts the Julian/modern date is abbreviated as Old Style/New Style, or OS/NS. For references in English demarcating the different effective dates and calculation tables for a particular region you may be interested in, please see references section, particularly the Oxford Companion volume and the JJ Bond Handy-book of rules and tables for verifying dates with the Christian era, which is now in the public domain. 3PP would like to thank Dr. Edward Goldberg, Terrence Lockyer, Thony Christie and Christian Opitz for their assistance and generous sharing of resources. It gets even more fun when you are working on 18th century relations between Britain and Italy and they each use different calendars and you aren't sure whether a British person in Italy is using British dates or Italian ones! Hello Katya! It would be a real worry of it was a British lawyer, in Florence, but following the date for the legal system in the UK, which had its first day in September! I think we are very lucky to have a somewhat more uniform system these days, at least as far as the date is concerned. The Oxford Companion to the year has some great accounts of the widespread confusion the multiple calendars caused, particularly in the 18C. I definitely recommend it! I will look at the Oxford Companion. Another source of confusion for me sometimes is when writers don't indicate if they have adjusted the dates in line with modern ones. Honestly, it is confusing enough for people when we change the clocks one hour, must have been so much worse working out which year you were in! I was actually just reading an article yesterday where someone had corrected some dates and it allowed them to show that two artists had been in the same place at the same time and had therefore probably met, whereas previously everyone had thought a meeting was impossible. The importance of dates! What a complicated mess! This is starting to make me wonder what other pre-1750 dates might need to be slightly reconsidered by art historians. I'm thinking of other early works that have been prominently dated by artists, like Dürer's prints. However, I suppose that some of the recorded calendar years might still be correct, depending on the time of year that the work of art was actually created. One further, possibly interesting, point about the inscription recording Francis' decree concerns the meaning of the two taller capital I's in AVSPICIS and IMPERI. The nominative forms are "auspicium" and "imperium", and according to the strict rules of Latin declension the case endings "-is" and "-i" should be appended to the stems "auspici-" and "imperi-", producing "auspiciis" (ablative) and "imperii" (genitive), although such doubled i's in case endings are sometimes dropped (thus "the poems of C. Valerius Catullus" may be written as either "carmina C. Valerii Catulli" or "carmina C. Valeri Catulli"). It seems that this inscription has been carved using a convention according to which the doubled vowel in the oblique cases of such words is indicated by a taller letter. It may be worth expanding upon the further wrinkle in the territories using Annunciation Style mentioned in H's comment above. In most places, including Florence, anniversaries of the Annunciation were counted beginning with 25th March 1 CE / AD of the Julian calendar, the March *after* the first Christmas, so that, had Francis' decree not been made, the year 1749 (of the Annunciation) would have run from 25 March 1749 to 24 March 1750 (Julian); however, in some regions, notably Pisa and its sphere of influence as late as the period of the Florentine reform, the so-called Calculus Pisanus was used instead, counting logically correctly (since the Annunciation must logically precede and not follow the first Christmas) from a year earlier, so that Year 1749 of the Annunciation would have run from 25 March 1748 to 24 March 1749 (Julian), since Year 1 of the Annunciation would have begun on 25 March 1 BCE / BC (Julian) and included the first Christmas, rather than beginning three months after the first Christmas as in the Florentine and similar systems. @Katya - great point about the improtance of clarifying dates! Absolutely essential when trying to establish a chronology from archival sources. @M - Interesting point! When Dürer etched 1514 into a plate for printing, that was the correct date as far as he was concerned, the trouble comes to later cataloguers and chroniclers, attempting to organise his work and movements. These calculations would need to made for this to be done accurately. This type of discussion seems to figure less in art historical accounts, I've predominately found it in publications based on archival sources. @TLockyer - Many thanks for your stellar contribution. I only have a vague sense of the difficulties engaging with Early Modern Latin and am imagining the vowel use you describe is one of these later contortions of the language that was not present in sources from antqiuity. The years of reckoning (starting point of the calendars) you mention another curious point - thank you for clarifying. Also worth noting was the fact that in the locations where calendars changed from Julian to Gregorian, the year was effectively shorter, starting in March 25 and ending Dec 31! Some territories were fickle with their choices and changed back and forward from Jan 1 to their original "New Years" date - which would have undoubtedly added to the confusion.